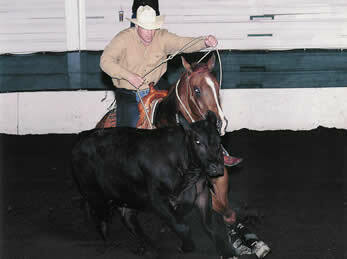 Q: Can you use it for reined cow horses? A: Yes, you can go down the fence and circle just as you would with any cow. It's been used successfully by many other trainers in this way. Q: We use buffalo for our team penning and this sure looks handy, will it work for us? A: We have found that you can save your buffalo by using the Hydrabull 2-3 times per week and then going back to using the buffalo. Q: How deep does the ground need to be? A: Depth doesn't make any difference, we just groom and smooth the ground. Q: How much smoothing do you need to do to the ground? A: The ground should be relatively smooth, more for the driver's comfort than machine performance. With the turf tires inflated to 10p.s.i. the HydraBull can handle pretty much any type of ground. Q: Is the HydraBull noisy? A: The driver is able to communicate 1-way with the rider very easily. One of our clients put it this way, "It's quieter than our tractor." Q: What is the top speed of the HydraBull? A: About 20 mph (but admittedly, we haven't clocked it with a radar gun). Q: At what RPM does the HydraBull operate? A: About 2600 to 2800 RPM (max is 3600 RPM). Q: How much gas does it use? A: You can train 20 head of horses on one 1 1/2 gallon tank. Q: Why should I buy a HydraBull? A: The #1 reason...it can cut your live cattle costs by up to 70%. When you add the HydraBull to your training program you can cut your live cattle needs down. You'll be saving time and money by not having to feed, clean up after and doctor the additional cattle! You'll soon see that the HydraBull literally pays for itself. A: The Honda engine comes with a factory 2-year warranty. Any Honda dealer can service the engine. The hydraulics and all other parts manufactured by HydraBull LLC carry a warranty of 1 year. Q: Do you have any other models? A: We just offer the one model at this time. A: There is no charge for crating the HydraBull. Shipping varies depending on carrier, distance traveled and whether you need rush delivery. We work with national carriers (and even ship internationally) to arrange shipping for you but all shipping and freight forwarding charges are the responsibility of the purchaser. Shipping weight is about 820lbs. Q: I've had an electric cow but was always having problems with the batteries. How noisy is the HydraBull? A: With the HydraBull you never have to worry about recharging batteries. The noise level is low enough for one-way communication between driver and rider. Even horses that are scared of a flag will work with the HydraBull.